YOWIE is about to evolve again. As all YOWIE trackers know, the beast is prone to bursts of intense activity, followed by a period of hibernation. 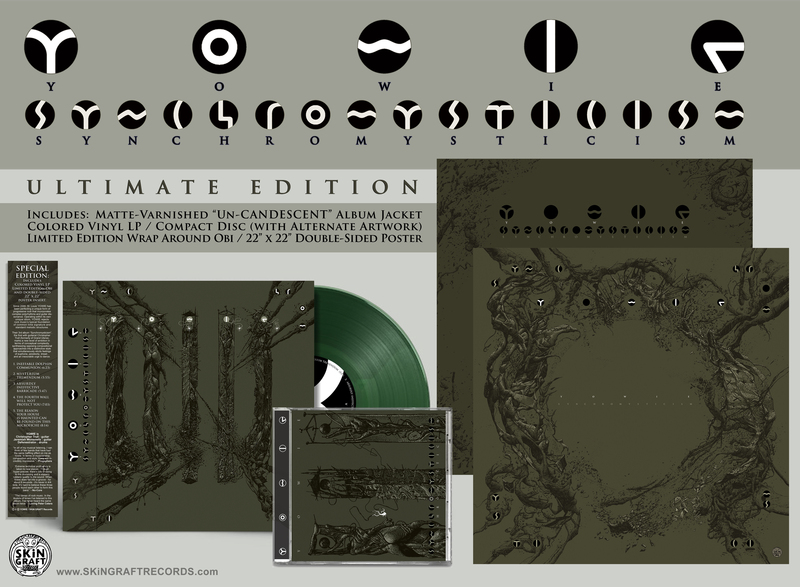 The last time YOWIE went subterranean; after recording "Damning With Faint Praise"; it re-emerged with the current lineup of Trull / Wonsewitz / Defenestrator, the lineup that created “Synchromysticism". Well, here we are again. This incarnation of the band will perform one last time in its native habitat of St. Louis, Missouri on December 30th, 2017, at Foam (3359 S Jefferson Ave, St. Louis 63118), with Skin Tags and Jr. Clooney. The band will play an extra long "European" style set to say goodbye to this lineup. Hope you can make it. The next step in YOWIE evolution is already underway and new potential Yowie limbs, organs, and other appendages are starting to sprout and take form. huge 22” x 22” double-sided Poster by cover artist Arnulf Rödler. - BREAKING NEWS!!! :The SKiN GRAFT Records Black Christmas Blood Drive is now live and will end at Noon CST on Tuesday, December 12th, 2017. - PLEASE NOTE: The SKiN GRAFT Shipping Department will be closed from November 29th through December 11th. We will still be taking orders, but all orders received during this period will not ship out until shipments resume on December 12th. Thanks! We’ve just gone live with our 2017 CHRISTMAS sale. The sale is for select physical LPs, 7”s and CD’s - and only applies to orders placed through the SKiN GRAFT Records Black Christmas BLOOD DRIVE Sale page HERE. Thanks for all of the support this year. The bands and I really appreciate it! Ho! Ho! Ho! It's none other than Jazzy Joe! Judging by the number of black eyes sauntering in and our of the SKiN GRAFT offices of late, I'd say that last month's BLOOD DRIVE Sale was an unqualified hit! But through it all, amidst the countless hosanna's on high, one request was heard loud and clear - "Howzabout including some 12" Vinyl in the sale"?!!? Okay Kimosabee, your wish is our command! Take that stocking out of your pants - pronto -(!) - 'cuz we're dropping our BLACK CHRISTMAS sale as of right NOW and this stuffer is going to help you ding-a-ling out the old year like never before! 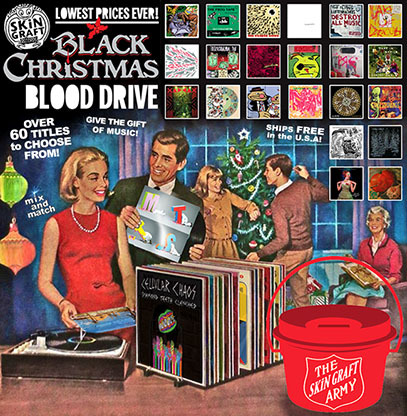 The SKiN GRAFT Records BLACK CHRISTMAS BLOOD DRIVE SALE is an extension of the biggest sale in our history - focused on select 12” Vinyl Records, Compact Discs and 7" Singles. The price paid is based on the quantity ordered - and an order of 10 or more items gets you the deepest discount! Get all of the details and visit the sale HERE. For a behind the scenes briefing on the distributor bankruptcy that ultimately led to this sale, see theNews Desk update from October 16th below. If you are looking to score our non-sale items - such as the new releases from Yowie, Cheer-Accident or the remastered Flying Luttenbachers LP, please visit our standard storefronts - the SKiN GRAFT Paypal Shop or Bandcamp Store. Like Mark said last time, there’s more than a quarter century of our music history reddened, ripe and ready to be discovered! Sale ends at Noon CST on Tuesday, December 12th, 2017. Wipe those weepers, take a deep, deep breath, and skooch just a bit to the right, 'cuz your wayward white-collar wielder of way-out wonderment has returned to illuminate the ill, enlighten the frightened, and soothe the sorrows of sad sacks far and wide! That's right, Jazzy Joe is back in the hood and your martyr of misanthropic mayhem is hitting the rewind button to drop some serious mad science from our wayback machine, in the sensational, superfluous SKiN GRAFT style!!! 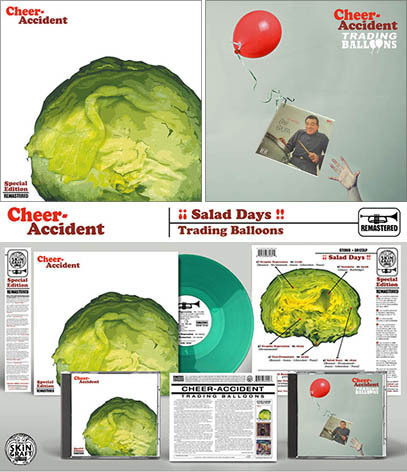 Hottttt on the high heels up the release of newly remastered editions of Cheer-Accident's "Salad Days" and "Trading Balloons" albums (read below) comes none other than the NEXT ONE you've all have been baiting your breath for! Con-spicuously absent from the SKiN GRAFT Records Bandcamp page til just NOW, allow me to allow you to put your paws together for the "Gumballhead The Cat" CD and Comic Book set from Cheer-Accident - now available digitally in its entirety for the first time ever - and we've got a bushel and a peck of physical copies to sell as well! In a masterful multimedia mishmash of formats, cartoonist "Rootin" Rob Syers drew up a full length Gumballhead The Cat adventure - "The Mystery Treasure Of The San Miguel Apartments", a mind-boggling foray into the sublimely silly; filled with page after page of unshaved, balls-out action! 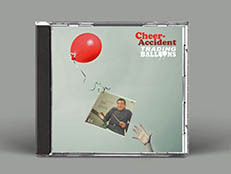 Accompanying this feline funny book is an exclusive CD soundtrack recorded specifically for this release by Chicago's CHEER-ACCIDENT. Sporting a perplexing palette of opulent musical textures, and lightning in a bottle aural episodes - these custom compositions bring the broad ink strokes of Gumballhead The Cat hurling into the fifth dimension as never before!!!!! We're talking OVER 60 MINUTES of adroitly extrapolated audio intrigue and jaw dropping dynamic group interplay - some bordering on the telepathic!!! 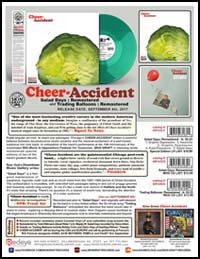 The physical edition of the CHEER-ACCIDENT "Gumballhead The Cat" CD and Comic Book Set comes complete with a big 7" x 7" comic book packed alongside the pocketed, glass-mastered Compact Disc in a resealable plastic sleeve that allows for easy storage among your 7" singles - and being encased in plastic, it's protected against stray spray in the litter box! 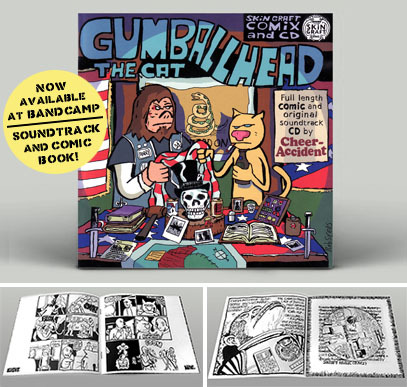 The BANDCAMP exclusive deluxe digital version includes all 13 tracks - plus a 20 page Gumballhead The Cat PDF Comic Book! A PREVIEW of the COMIC BOOK is available for viewing HERE and orders are being taken for both the physical and digital version over at our Bandcamp Store. For a physical-only fix, stop by our standard storefront, the SKiN GRAFT Paypal Shop. Alrighty Alums and Chums - your nutty news hound is keeping his glorious return short and sweet this time, but you can bet ALL of your bottom's dollars that you've not heard the last of Jazzy Joe. Watch this space for more wizened wordage before the month is out! This is Mark filling in for Jazzy Joe. 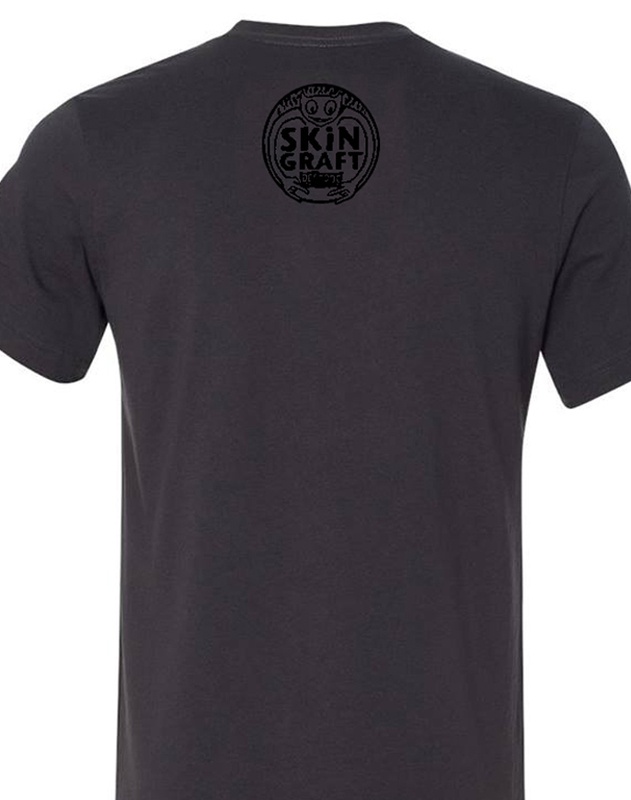 Last year SKiN GRAFT Records turned 25 years old. 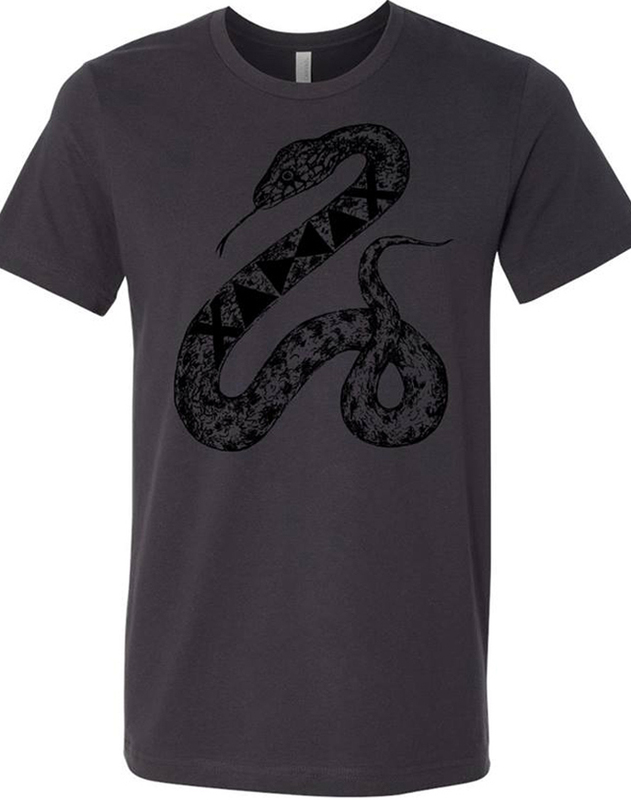 We marked the occasion with the move to a new distributor, the launch of our new T-Shirt line - "Unfit Apparel”, new releases from Cellular Chaos, Arab On Radar, Lovely Little Girls and Doomsday Student - and a special 25th Anniversary reissue of Dazzling Killmen’s “Face Of Collapse”. Allegro began as a classical distribution company, and expanded its repertory into other genres in the early 2000s. But behind the scenes, things were "complicated". Nail / Allegro Music - our primary distributor since 2003 - had gone bankrupt - and was doing its level best to take every label on its roster down with it. Prior to going bankrupt, Allegro went through an out-of-court liquidation that enabled them to keep every distributed label’s unsold, unpaid for inventory and sell it off to to pay back their secured creditors - - - - rather than record labels themselves - which had already gone months and months without payment. Fortunately, SKiN GRAFT escaped Allegro before word came down that they were liquidating the business. We landed at Redeye Distribution, but when all was said and done SKiN GRAFT and it’s bands had lost thousands upon thousands of dollars due to Allegro’s non-payments. When we reclaimed our inventory, we shipped most of it back to our warehouse space in Missouri while some went to Redeye for distribution to stores. Now as everybody knows, retail space for music has been in decline for over a decade as countless record shops and chains have shuttered - leaving us with some truly amazing, thriving independent shops - but also leaving our warehouse with more inventory than is needed to stock those remaining shops. 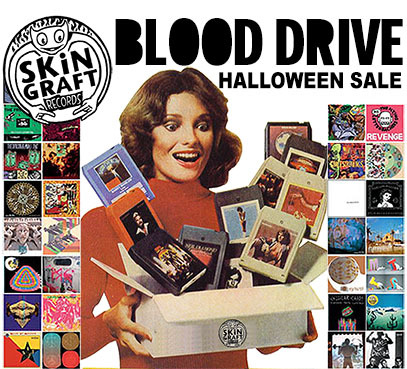 SO - to level things off and clear out some storage space, we're announcing the biggest sale in our history - THE SKiN GRAFT Blood Drive - focused on selected 7” Vinyl Records and Compact Discs. 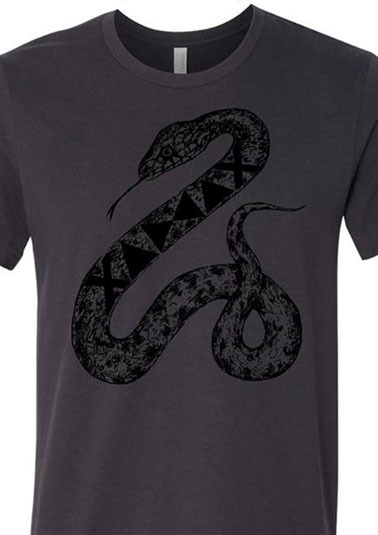 Get all of the details and visit the sale HERE. If you’d prefer to pay the normal price, or are looking to score our non-sale items - such as the new releases from Yowie, Cheer-Accident or the remastered Flying Luttenbachers LP, please visit our standard storefronts - the SKiN GRAFT Paypal Shop or Bandcamp Store. There’s more than a quarter century of our music history reddened, ripe and ready to be discovered. SALE ENDS at NOON CST on November 1st, 2017! and (2) MOD CDs: "Salad Days: Remastered"
European Tours begin this September! 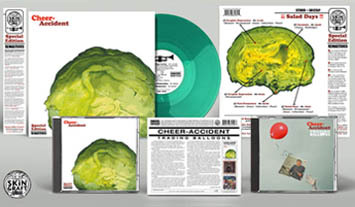 Thanks to a piece of press in the Chicago Reader, the word is out that SKiN GRAFT Records will be releasing a new album from CHEER-ACCIDENT in 2018 (! ), but we're not waiting for the turn of the year to start celebrating... we've got some Rip Taylors to drop right here and now! 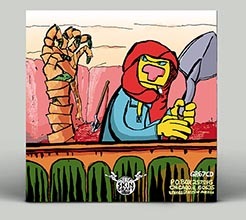 In anticipation of the band’s performance at the 10th Anniversary of the reanimated RIO (Rock In Opposition) Festival this September, SKiN GRAFT is releasing newly remastered special editions of two of the band’s greatest albums: "Salad Days" and " Trading Balloons". Recorded just prior to “Salad Days”, and originally self-released by the band in a very limited edition, the 52 minute song “Trading Balloons” anticipated the direction the band would take in years to come - exploring a dizzying blend of musical styles: from Zeppelin-esque bombast to folk-tinged Americana to Stravinsky-flavored progressive rock to cinematic melodrama and beyond. o Both albums extensively remastered by Todd Rittmann of U.S. 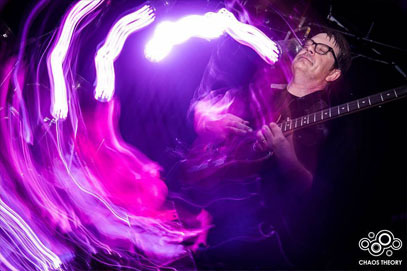 Maple and Dead Rider and redesigned by SKiN GRAFT Records' Mark Fischer. o "Salad Days" recorded by Steve Albini and pressed on vinyl for the first time ever. 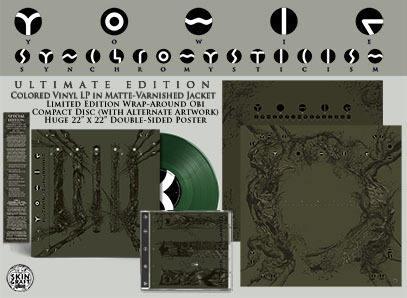 Record includes randomly mixed Colored Vinyl LP and collectible wrap-around Obi. 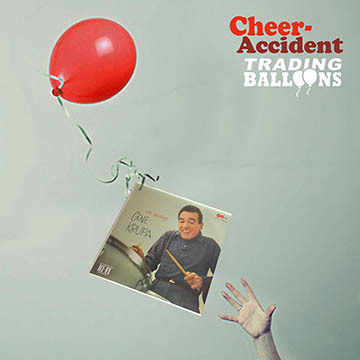 o "Trading Balloons" receives its first ever commercial release! Guests on "Trading Balloons" include Bobby Conn and Darin Gray of Dazzling Killmen and Brise-Glace. 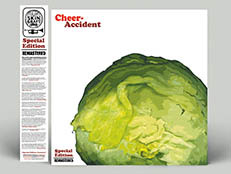 o CHEER-ACCIDENT will be touring the USA and EUROPE and will be performing at France’s RIO Festival alongside GONG, ACID MOTHERS TEMPLE and FAUST this September. St. Louis, MO. Schlafly Tap Room. 2100 Locust St.
KC, MO. Record Bar. 1520 Grand Blvd. Chicago, IL. Beat Kitchen. 2100 W. Belmont Ave.
Indianapolis, IN. Radio Radio. 1119 E. Prospect. "Salad Days" / "Trading Balloons"
NEW T-SHIRT UP FOR ORDERS! 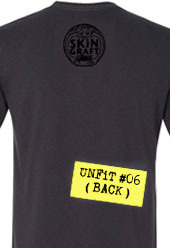 UNFIT Apparel T-Shirt orders will be fulfilled by The DARK SLIDE Skate Shop, not SKiN GRAFT. 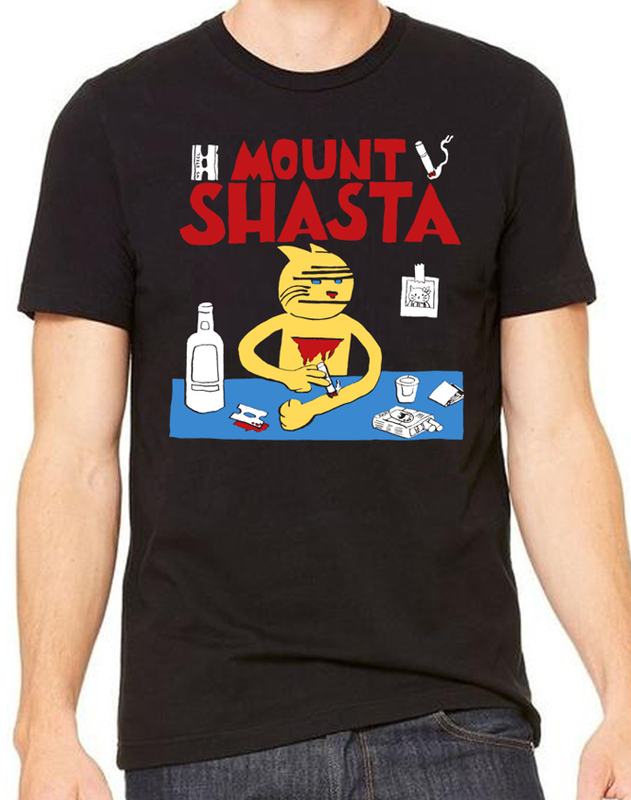 T-Shirt orders will be re-directed to their storefront. Other items from the SKiN GRAFT Shop may NOT be combined with UNFIT Apparel. Nick Sakes (Dazzling Killmen, Colossamite, Sicbay) and Chrissy Rossettie Sakes (The Hex, My Name is Rar-Rar, Iyaxia) form Xaddax — a kinetic, No Wave-y two piece from Kingston, NY. Sakes’ jagged guitar parts and legendary howls lurch across the backdrop of Rossettie’s haywire electronics, meandering synth, and frenzied drumming. The result is erratic and wild; a malfunctioning robot/injured werewolf hybrid. 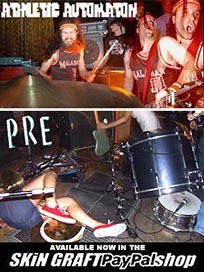 Their first album, "Counterclockwork", was released on SKiN GRAFT Records in 2012, and new material is in the works. A new split 7” single with two new songs will be out early next year. Watch this space for an announcment soon!